HECTOR HERNANDEZ’s photographs of bodies in motion, swathed in brightly colored fabric, examine the figure’s relationship to space. Face and gender obscured, the human bodies are stripped of all markers of human identity, allowing them to become otherwordly hyperbeasts. In 2012 he was nominated for “Austin Artist of the Year Award” in the 2D category by the Austin Visual Arts Association. 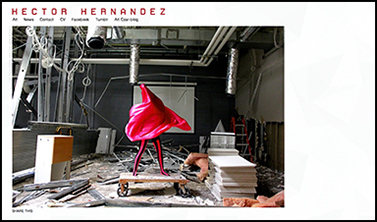 His work was recently shown at SXSW 2013 and in Cantanker: The End at Big Medium Gallery in Austin, Texas, where Hector lives. 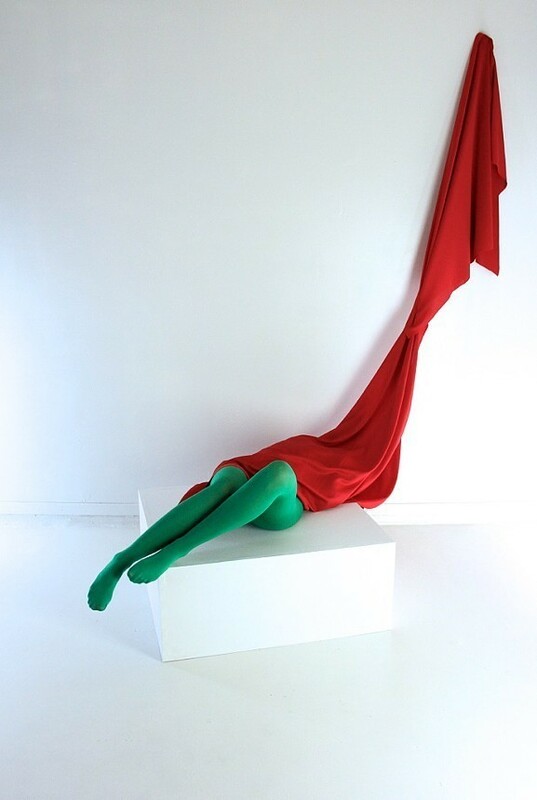 OtherPeoplesPixels: Your work strongly references fashion photography with its emphasis on the female body as an object, but it resists that designation because the accumulation of repeated poses and visual motifs asks me to muse about the intent of the images in a way I never would with fashion photography. Are you influenced by fashion photography? Hector Hernandez: Interesting that you bring up fashion photography. 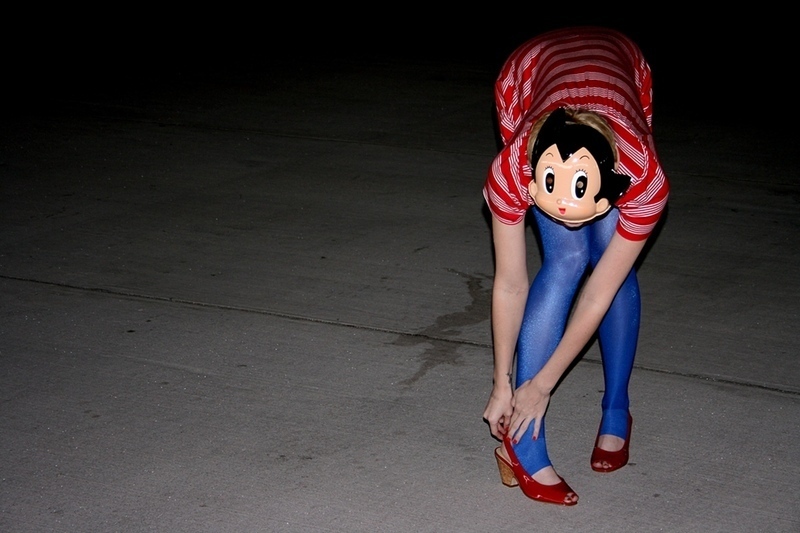 To be honest, fashion photography has never been a source of inspiration for me. I can see why people might think that it is, but no. I can say that my recent work has been somewhat inspired by Christo and Jeanne Claude’s The Gates and a desire to experiment with movement. What I am trying to do with my new work is to capture that one second in time when everything is perfect: the power of the body, the energy going through the fabric and the balance of light. OPP: You (almost) always obscure the identity of your models by hiding their faces, either with masks, sheets or pompoms. In early work, your models seem to be predominantly female, which brings to mind the discourse surrounding the male gaze and the objectification of the female body in art history. But some of the images also reference superheroes, who are masked for a very different reason. Could you talk about this recurrence of the masked female in your work? What does it mean to you? HH: I have always been interested in the idea of identity in art. Some of my work is an attempt to explore this concept, but also to have the viewer feel that they can relate to my subjects. My exploration began with the Astro Girl series. Astro Boy, a Manga character from the 1950s, is this little, shiny, cool-looking, powerful boy-robot that seems to be perfect. Created to replace a scientist’s dead son, he is summarily rejected for the very fact that he is not human. So, while we may see the face of a shiny perfect little boy, behind that mask there is another story. The same is true for all of us. Behind our masks there are other stories, other perceived imperfections. In my Astro Girl series, I created a character that is supposed to represent physical beauty and perfection. But despite the model’s perfection, she wears a smiling mask. By photographing her at awkward angles and poses, and in odd situations, I am attempting to expose what lies behind the mask: the vulnerabilities we hide and our fear of showing people who we really are. The superhero series was really about indulging myself. I’ve always loved superheroes like Batman, Superman, Spiderman and their associated imagery and stories. I decided to create my own character, Mrs. Nitroglycerin. Since there are plenty of male superheroes out there, I created a female character with her own look and weaponry. The look I came up with draws on some recognizable superhero imagery, but I also tried to make her stand apart and to make it clear that she is nobody’s sidekick. OPP: Does Mrs. Nitroglycerin—interesting that she’s a Mrs., not a Ms.—have an origin story? Tell us about the design of her mask and her axe. HH: The idea was to make a female supervillain, the anti-Capitan Planet. Mrs. Nitroglycerin isn’t planting trees; she’s cutting them down. I wanted her character to have a colorful weapon, and I thought that an axe would be the perfect accessory. At the time, I was experimenting with different materials and started working with foam sheets. I love the possibilities that are open to me when working with foam. There are lots of color choices, and the material is easy to manipulate. When it came to designing Mrs. Nitroglycerin’s look, I decided to use a Batman mask as a foundation. The iconic shape of the mask would give the viewer something that was instantly recognizable, but by adding the layers of color and texture, I hoped to create a unique look and character. When I was done, all she needed was a name. I wanted something that sounded dangerous . . . explosive. And, what’s more explosive then nitroglycerin? I decided to make her a Mrs. to give her a bit of a backstory. There is clearly a husband out there, maybe estranged, maybe missing . . . Is he her better half or her worse half? Who knows? OPP: Hyperbeast and Hyperbeast Lives, your most recent bodies of work, are very different. It’s clear how they grew out of the older work, but some of these models could be either male or female. And the bodies are less sexualized than in earlier work. Was this intentional? What is a hyperbeast? HH: I agree that the Hyperbeast series is very different from my older work, but still heavily influenced by the same inspirations. This new series is still about form, life, light and movement. When I first began the series, I was interested in creating new characters, but I also wanted to add an element that I felt had been missing from my previous work. Color. The explosion of color is the “hyper” in hyperbeast. Bold, untamed and vibrant. The move towards gender ambiguity in these pieces is deliberate. No flesh is exposed, and I do in fact use both female and male models in the series. The creatures are not human at all, and because of this I feel that their genders should be left unrecognizable. I began the series by experimenting with fabrics and how light reflected on them. When I added movement, the fabric changed from something I recognized as a piece of cloth, thin and fragile, to a mass of shapes and light. The hyperbeast was born. I imagined that these creatures exist in some other universe, that they roam wild somewhere, like lions or giraffes in Africa. I am simply capturing them in their natural habitats. Then again, I sometimes imagine that these hyperbeasts exist in our own world at some hidden level. They could exist, hidden to us in the same way that atomic and subatomic particles used to be hidden. These creatures could be a part of our world, dancing and living in the same spaces where we exist. OPP: The shift out of the white cube and into the world helps me see the figures as creatures. In the studio shots, I read them more like sculptures, but in Hyperbeast Lives, they do become more alive. Are abandoned buildings the natural habitat for Hyperbeasts? Or will you eventually photograph them in other environments? HH: When I started on this series, I did want the Hyperbeasts to look like sculptures. The idea was that the creatures were sort of like hunting trophies. I was the taxidermist mounting the beasts and making them look alive. But after experimenting in the studio, I wanted to see the beasts completely free in the wild. I’ve always loved the way old abandon buildings look, so that’s where I went to find them. But, I do think that they live other places, too . . . I’ve caught glimpses of them here and there. OPP: I’d like to hear more about your mixed media work, which combines your photographs with appropriated imagery from comics and advertisements. Would you pick your favorite mixed media piece and talk about the juxtaposition of the imagery you chose? HH: I started working with mixed media four years ago and had very clear ideas about what I wanted to do. The intention was for every mixed media piece to represent a distinct moment in my life that had some kind of impact or that shaped who I am today. The piece that I feel illustrates this idea most strongly is Dogs of War. 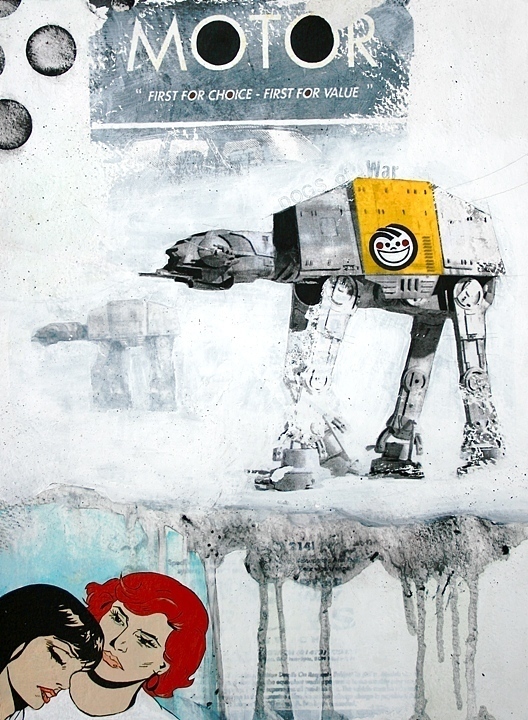 In this piece I juxtapose images of an Imperial Walker with advertisements and images of crying women. As a child, I loved Star Wars (and still do). I loved every aspect of it: the toys, the movies, the characters and especially the story. But, it is fundamentally a story about war. As a child, I didn’t understand what that really meant. That changed somewhat when I was seven with the bombing of Libya. I remember very clearly the day that I sat down with my grandmother to watch the evening news that was flooded with images of the bombing. The destruction, the talk of war, and Tom Brokaw’s repeated assertion that “we were a nation at war” convinced me that the fighting and the bombings would arrive at my doorstep any minute. Yet, at the same time that these frightening realities were being reported, there were still commercial breaks. Along with the footage of bombings and interviews with soldiers’ crying mothers and wives there were commercials for cleaning products, cars, sodas, chips, and Star Wars toys. Dogs of War is my attempt to collect those disparate images and ideas from that one moment. OPP: What was on the last role of film you shot? HH: The last time I used film was back in 2008. I shot two roles but only developed one. The shots in that one developed role included some that would later lead me to the Astro Girl series. The undeveloped role actually contained some pictures of my mom’s dogs. My mom actually asked after those photos for about a year, but I never got around to developing them. I should probably do that at some point . . .
To see more of Hector’s work, please visit hectorhernandezart.com. 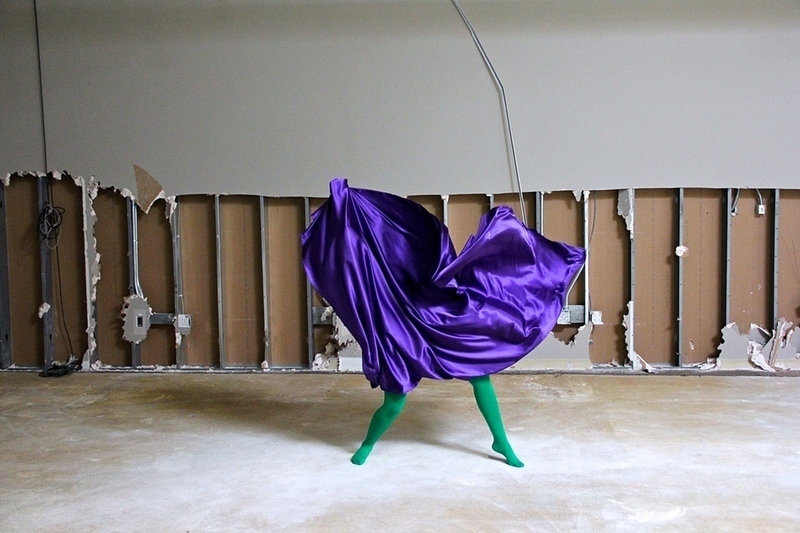 Featured Artist Interviews are conducted by Chicago-based interdisciplinary artist Stacia Yeapanis. When she’s not writing for OPP, Stacia explores the emotional and existential significance of participating in mediated culture in her embroidery, video, sculpture and collage works. She received her MFA from The School of the Art Institute of Chicago (2006), where she will begin teaching in Spring 2013, and is currently a 2012-2013 Mentor-in-Residence at BOLT Residency in Chicago. 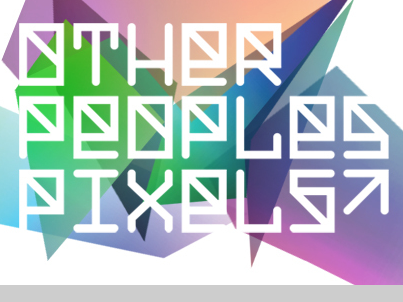 Notable exhibitions include Losing Yourself in the 21st Century (Maryland Art Place, Baltimore),MP3 (The Museum of Contemporary Photography, Chicago), Please Stand By: Stacia Yeapanis + Readymade (Baang & Burne Contemporary, New York), Over and Over Again (BOLT Project Space, Chicago). I’m Hector. I make art, take photos and make sculptors. The power of the body, the energy going through the fabric and the balance of light. I don’t think I had a choice, I love making art. Name some artist you would like to be compared to. Not sure I want to be compared, I would like to be respected for what I do.